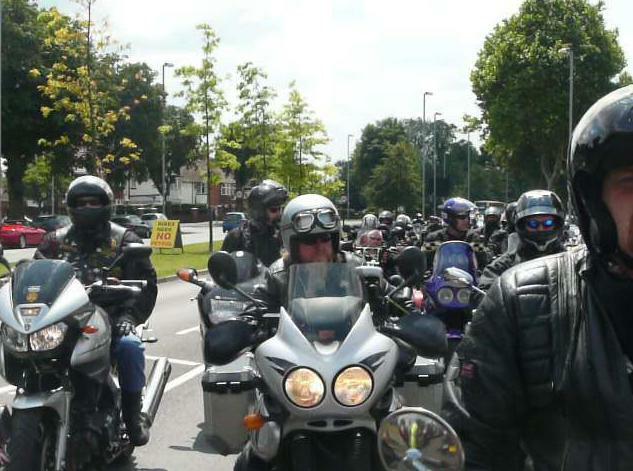 Like their French counterparts a couple of weeks ago, British bikers gathered yesterday in Birmingham, UK’s second largest city, to protest at a series of anti-bike measures proposed by the European Union (EU), of which the United Kingdom is a full and permanent member state. Among those measures, which are designed to bring extra cash to the national government of each member state, we could soon see all bikers across Europe having to wear high-visibility fluorescent vests, as well as banning the same bikers from servicing their motorbikes and scooters themselves, thus forcing them to have the job done by a registered mechanic instead. Those who currently service their bike themselves, including changing brakes, tyres and replacing defective parts, could soon be facing fines and prosecution under European rules if they fail to bring their motorcycle to a registered mechanic. Motorcyclenews.com report that Engine Control Units (ECUs), which govern fuel supply, could become sealed to prevent tampering, and exhausts could get bolts and could only be removed by dealers with specialised tools, according to the Federation of European Motorcyclists’ Associations (FEMA). All new motorbikes and scooters over 125cc will have ABS from 2017 under the plans, while smaller models will have to have either ABS or linked front and rear brakes. 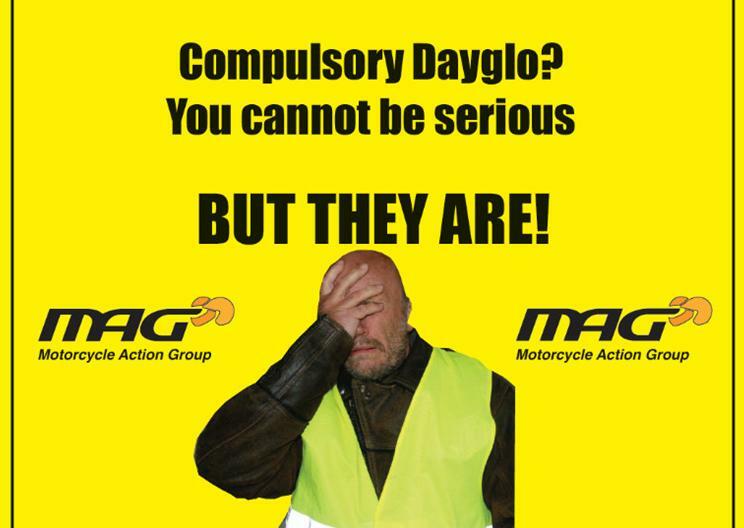 MAG – Motorcycle Action Group, a leading UK based motorcycle pressure group – organised yesterday a UK wide demonstration in Birmingham to show the EU politicians who are trying to push through the above measures (among others) that British bikers, along with their French neighbours, will stand up against them until these vile attacks on motorcyclists across the EU are totally abandoned. Whilst France and the United Kingdom each have their own domestic issues (such as for instance a ban on traffic filtering / lane splitting in France and the unpopular introduction of a motorcycle parking tax in central London by Westminster City Council), anything that is Europe driven will be fought against in a united manner across borders. This biker is wearing a high-visibility vest - that's all they need according to the proposed European legislation! It was interesting to see how forcing all bikers to wear a high-visibility vest was perceived in the UK compared with France. Bikers in both nations seem to be totally opposed to the idea on the basis that the proposed legislation fails to consider what protective clothing must be worn underneath that vest to ensure the safety of all riders. Like in France a couple of weeks ago, a few riders turned up at the demonstration yesterday wearing what politicians consider to be absolutely legal across the European Union (see left). Could we say that those politicians have just not got the slightest clue about riders’ safety or would that be an under-statement? If a candidate turned up for module 2 of the motorcycle test dressed like the rider shown on the left and made absolutely no mistakes during the test, would the examiner have grounds to make the rider fail the test just because of their clothing? The end of home servicing? Well done to everyone that turned up at the Birmingham demo yesterday. 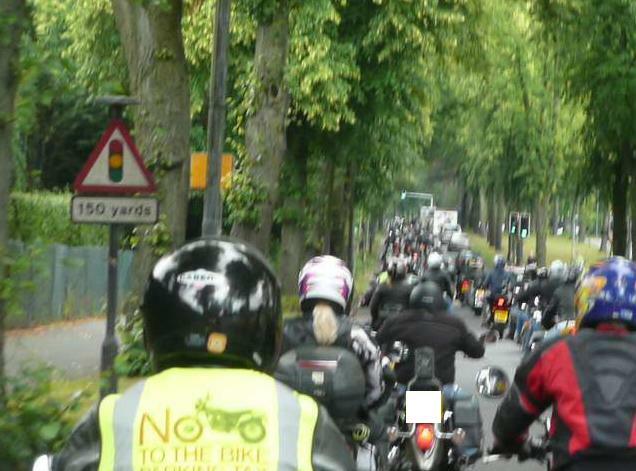 Just wanted to say that having done both the Leeds and Brum demo I’m staggered by the apathy and lack of support for these demos from UK motorcyclists. 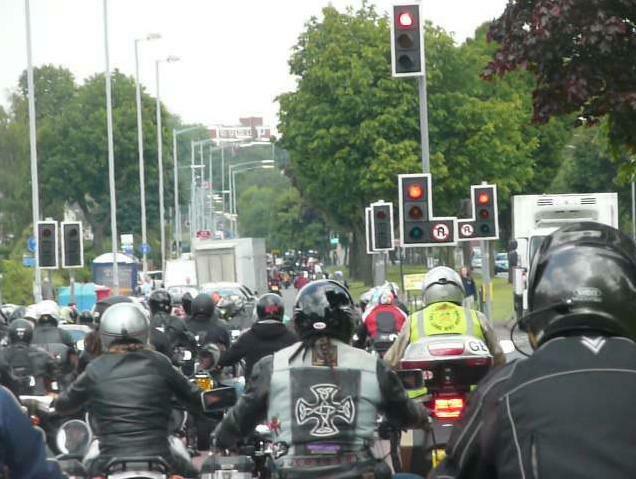 Apathy from UK motorcyclists is nothing new but faced with the legislation now imminent from Europe (and I guess more to come) how come France puts more than 100,000 on the streets and we put hundreds? – perhaps when its too late and the laws are passed the people who didn’t turn up will then point the finger at someone else and say why didn’t MAG stop this?!!!! – pathetic whinging moaners. I didn’t turn up.. I like to think if the bike wasn’t off the road I would have been there. im doing mods to the bike, I agree we need to take responsibility and stand up for our rights and spread the word to fight for our freedom of choice..if these ridiculous laws get passed.. doing our own mods will be thing of the pass. keep it up guys…we are all with you ! I have literally just found this site and I must admit I was unaware of the Birmingham and Leeds events, many of us were unaware of them and only became aware of our impending doom from the idiots at the EU in recent weeks. I agree with Kev, many bikers do seem to think that if they do nothing the problem will just go away. Also and I find this more disturbing than anything else, the French event which was massive went completely unreported by British media including the BBC, from my perspective they come across as not wanting to rock the boat with the UK government by not printing or reporting on what could be classed as inflammatory material, errm excuse me but they are supposed to report the news and they totally failed in that regard.